See in Glossary in a skeleton to predetermined values. The position of a child joint changes according to the rotation of its parent and so the end point of a chain of joints can be determined from the angles and relative positions of the individual joints it contains. This method of posing a skeleton is known as forward kinematicsThe geometry that describes the position and orientation of a character’s joints and bodies. 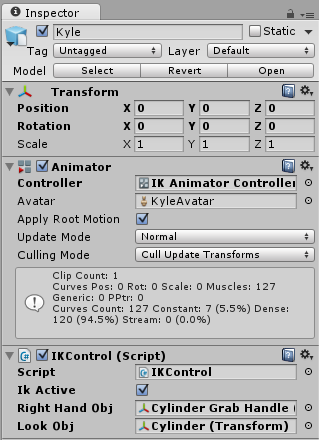 Used by inverse kinematics to control character movement. However, it is often useful to look at the task of posing joints from the opposite point of view - given a chosen position in space, work backwards and find a valid way of orienting the joints so that the end point lands at that position. This can be useful when you want a character to touch an object at a point selected by the user or plant its feet convincingly on an uneven surface. This approach is known as Inverse Kinematics (IK) and is supported in Mecanim for any humanoid character with a correctly configured Avatar. In the illustration above, we show a character grabbing a cylindrical object. How do we make this happen? See in Glossary, click the cog settings icon of the Layer and and check the IK Pass checkbox in the menu which pops up. //if the IK is active, set the position and rotation directly to the goal. 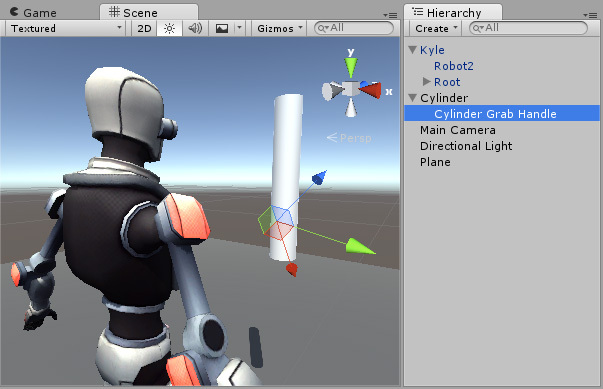 As we do not intend for the character’s hand to reach inside the object to its centre (the cylinder’s pivot point), we position an empty child object (in this case, named “Cylinder Grab Handle”) where the hand should be on the cylinder, and rotate it accordingly. The hand then targets this child object. In this example, we have the look target set to the cylinder itself, so the character looks directly towards the centre of the object even though the handle is near the bottom. Enter play mode, and you should see the IK come to life. 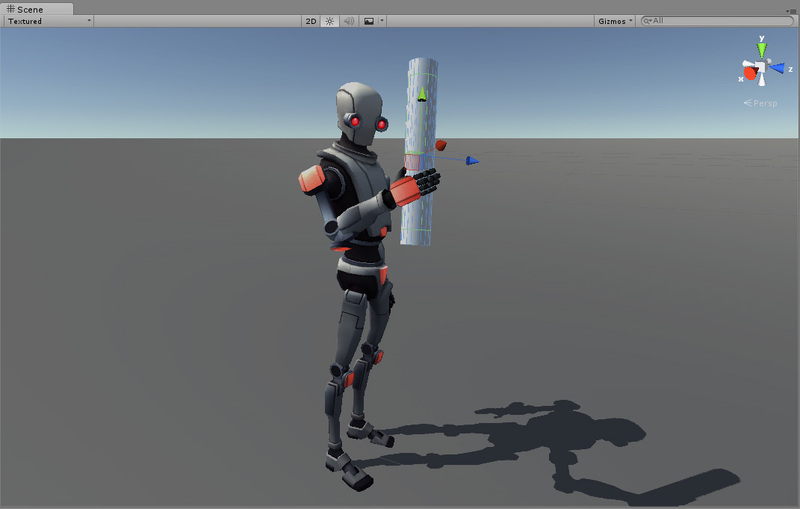 Observe the character grabbing and ungrabbing the object as you click the IKActive checkbox, and try moving the cylinder around in playmode to see the arm and hand follow the object.